Sony today announces the world’s first HD Video WALKMAN – the portable solution for viewing HDV and DV tapes while you’re on the move. 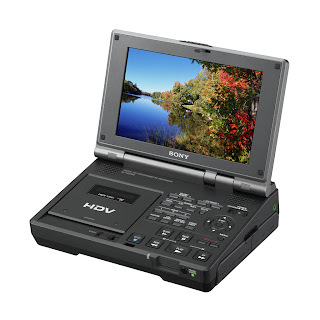 Packed with professional features, the versatile GV-HD700E plays back HDV as well as miniDV tapes (SP and LP). Its ability to record HDV1080i/DV signals from an external source also makes it ideal as a back-up deck for professional videographers covering weddings and other events. The clear, bright 7-inch widescreen (16:9) LCD offers a resolution of 1,152K (800x480x3[RGB]) dots for monitoring video and still images. An All-scan function ensures that 100% of the recorded frame area is displayed on the LCD monitor for accurate reviewing of shots. Up to six LCD panel setups can be stored and loaded at any time. The on-screen position of displayed timecode can be moved to any of six positions according to user preference. The screen folds down when the GV-HD700E is not in use for maximum portability. The HD Video WALKMAN is generously equipped with interfaces for recording and playing HDV1080i and Standard Definition DV video from a range of sources. An HDMI output allows HD viewing on any connected HD-ready TV or monitor. The GV-HD700E HD Video WALKMAN will be available throughout Europe from September 2007. Spend some romatic time with beautiful females at Mumbai Female Escorts. Visit us now to enjoy with females.Spend some romatic time with beautiful females at Bangalore Female Escorts. Visit us now to enjoy with females.